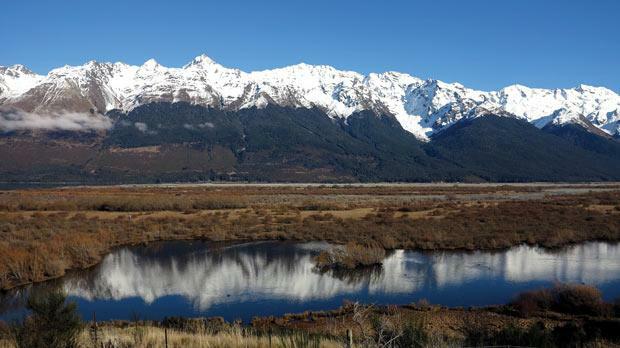 The marshes used in The Lord of the Rings. 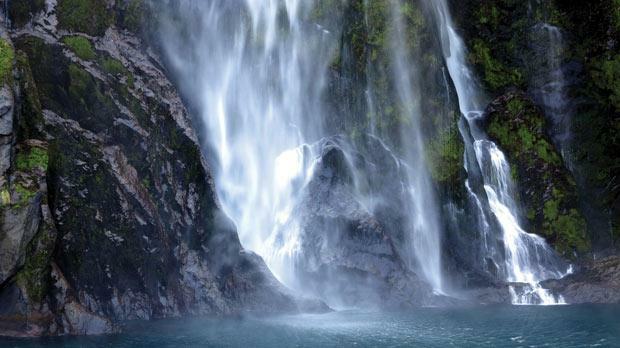 Four-hundred-metre waterfalls at Milford Sound. Queenstown as seen from the gondola station. Even through the plane window, I can sense the adventure. Glaciers glimmer beneath the wingtips, fjords dazzle between towering mountains, and as we touch down I watch boats accelerating across a lake. I’m landing in Queenstown, self-proclaimed adrenaline capital of the world, and home to the world's first commercial bungee. Walking through the town, the first question I’m asked is when I'm going to jump. Can I not think about it first? Cast adrift in the South Pacific, the landscape of New Zealand’s South Island has a primitive feel. Nature's scars dominate the panorama from my Queenstown hotel; jagged icy peaks, forests tumbling down mountainsides, everything mirrored and reflected in Lake Wakatipu. Yet there's something eerily familiar about it all. A Lord of the Rings tour takes me along the lake shore, into a mysterious marshland that marks the entrance to Mordor. Next there's a forest where dwarves battled orcs and now a mountain where a famous elf appeared. And it’s not just Lord of the Rings, but also filming locations from District 9, Tintin and X-Men. I'm regretting my choice of entertainment on the lengthy plane journey out here. Rather than brushing up on some otherworld epic, I was engrossed in losing Kasparov chess to a 10-year-old two rows behind me. The guide produces screenshots to rekindle memories of locations that featured in many of the films. Most Queenstownians can say the same. Local farmers rode horses into the battle of Rohan and slain bodies are usually students skipping class. The tour continues through the village of Paradise and I’m struggling to separate the fictional. Every corner and every landscape could have featured on the big screen. Running up to the hotel room I’m visibly disappointed to find that the wardrobe doesn’t hide Narnia. Queenstown’s adrenaline slant also seems to merge the boundaries into fantasy. Every other shopfront is selling adventure, images of ecstatic faces filling window-sized posters. The bungee is too much of a jump, so I start with jet boating. A narrow river zigzags through stark canyon walls and the pilot feeds on fear. We skid along the sapphire water, accelerating towards protruding boulders and then veering away at the last minute. If it was an amusement park ride I wouldn't be this scared. I put far more trust in mechanics than in a 20-year-old pilot who looks half drunk from last night. Bumping and buffeting, we speed through the canyon, hands gripped to rails as the boat spins 360° on a whim. There's barely centimetres between the boat and a high-speed collision with a cliff. Or is this just more clever South Island fiction? However, while the jet boat café proudly displays images of Queen Elizabeth II making a visit, I’m later told that crashes occur at frightening frequency. New Zealand doesn't conform to the mollycoddling over-cautiousness of other Western countries, which makes the jet boat all the more thrilling. But that doesn't help convince me to bungee. Something more sedate is called for. A gondola rises to the peak above Queenstown. Over a warming cup of tea the landscape extends; Lake Wakatipu all turquoise and clear, a white line stretching down the Remarkables Mountain Range, and now six people flying past me. Parasailers! What's wrong with merely savouring the serenity? The next morning I head west, meandering up and over mountain passes en route to the Fjordlands. 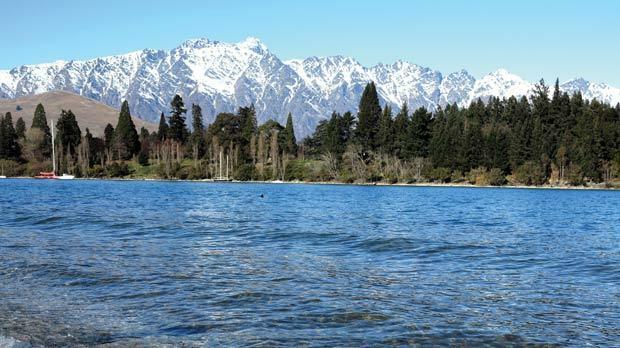 The South Island's Western coastline is almost entirely national park, a series of preserved wildernesses climbing uninhibited from the Tasman Sea. Rubble and ice clings to roads, lakes hide behind forests of ferns, and the journey is a slow one. Every couple of miles is a new photo, a new memory of uninhabited hinterland towering above the hire car. While there's no sheep clinging to the mountainsides, the vistas recreate all other idolised preconceptions of New Zealand. Milford Sound was the country's entry in the new Seven Wonders of the World contest. A veil of mist flickers across the fjord (I’m later told that the first Europeans erroneously called it a sound) as I take a scenic boat cruise. 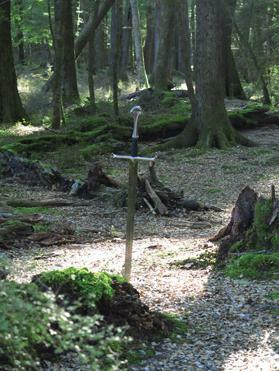 Recreating an orc battle in the forests near Queenstown. Four-hundred-metre waterfalls pour out of precipitous cliffs and the spray almost reaches a slumbering colony of seals. Dolphin fins appear then disappear. Likewise the mountain peaks. They emerge through the haze as shocks of blue fill the sky. But it’s all too brief as the mystical clouds seem to float on the water's surface. All around here there are fjords and glaciers, the white wonderland extending down to the very tip of New Zealand: next stop Antarctica. My next trip is Doubtful Sound. A boat crosses the peaceful waters of Lake Manapuri and then I journey overland before another cruise on to an incorrectly labelled fjord. Gradually the glacial waters merge with the grey Tasman and a voracious thunderstorm adds further authenticity to the experience. New Zealand’s untrammelled feel was part due to the indigenous Maori population. The first Europeans to land were Dutch pirate hunters. Dropping anchor beside these fjords, they blew on trumpets to signal their arrival. In local culture that meant a cry for war. Smeared in war paint, the Maori jumped into canoes and rode out with spears to meet the canons. Four Europeans were killed and Abel Tasman turned his boats around. The Maori certainly have less fear than I do. Back in Queenstown, whiffs of barbecue guide me through the streets. Some 50 people queue outside Fergburger, a local institution that is famed for its immense slabs of meat. The two girls in front of me have just returned from skydiving. A whole group discusses their day’s heli-skiing adventure. I order a double cheeseburger and receive a single. The locals clearly believe I’m not man enough for anything more. Outraged, I march to the bungee office yelling I want to jump tomorrow. “Which one?” comes the reply. Which one?! There are three to choose from, plus two bungee swings. The woman behind the counter tries to sell me a package containing all five, an offer that slices straight through my newfound confidence. One bungee is the original, the pioneering jump created by AJ Hackett in 1989. Another dives 134 metres off a suspended cable car. And a third seems to epitomise New Zealand’s South Island. The Ledge is also the shallowest jump and perhaps I’m just choosing it because my body is shaking in anticipation. So here goes ... I stand on a platform high above the town, admiring the twinkling juxtaposition of lake and mountain. Five, four, three, two, and I've already been pushed off, fear giving way to laughter as the rope leaves me dangling in the space above Queenstown. I could have jumped myself. Honestly. 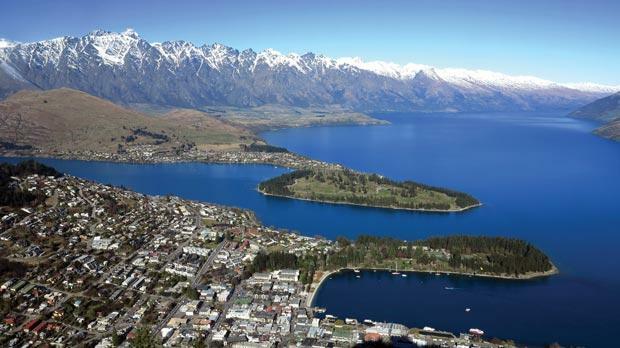 But there's a mischief to the South Island, one that helps elevate the impressions of escapism. The landscape radiates serenity. Every corner feels like a surrealistic break into a land that time forgot. But then the culture of adrenaline ensures that the landscape is truly alive, not just something that looks impressive in holiday photos.